Think about an MS Word software or any document editor software that allows you to type but not to modify, delete, edit... etc. How would that be? Useless, right? Same is true for a decision tree software. You need to edit a tree in any way you want. 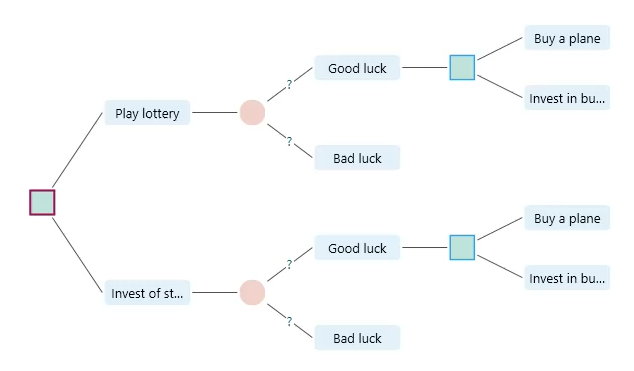 You want to cut/copy/paste between nodes, copy a subtree and replace a node with that copied tree, insert decision/chance nodes between 2 connected nodes etc. Yes, everything is possible with this Decision Tree Software and Analyzer software. 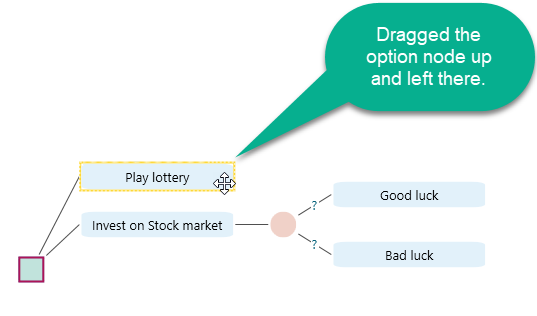 The Decision Tree Software software supports the following manipulations on the decision tree. 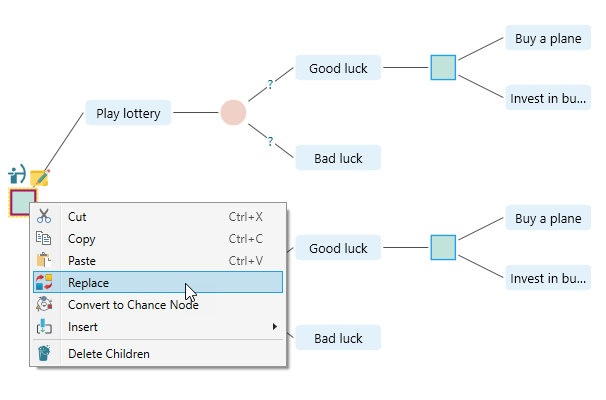 Convert to Decision Node or Chance Node. Cut, Copy and Paste a Node. Replace a node with copied node/subtree. Delete a node or children. Say, you have created a tree like this. Now, you want to rearrange the vertical position of the options. Simply drag a node and move up or down. Once you leave the mouse, you will see the tree is rearranged. 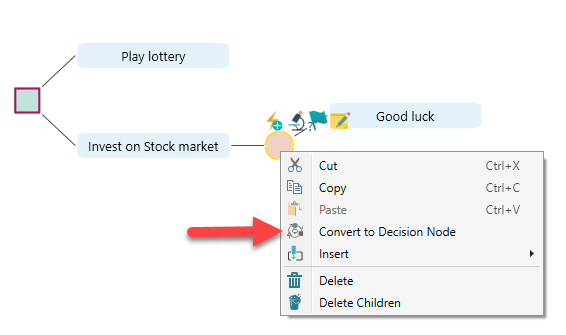 Select a Chance node, and right-click to open the context menu. You will notice the option "Convert to Decision Node". If you select that menu, you will see the chance node is converted to a decision node. 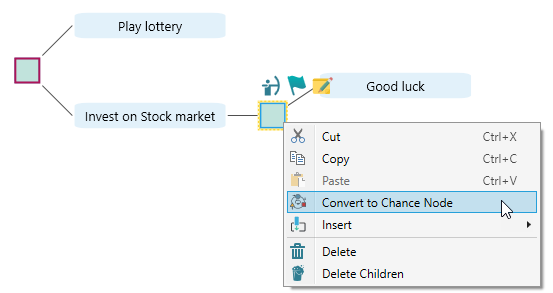 If you selected a decision node, then you could see the option "Convert to Chance Node". 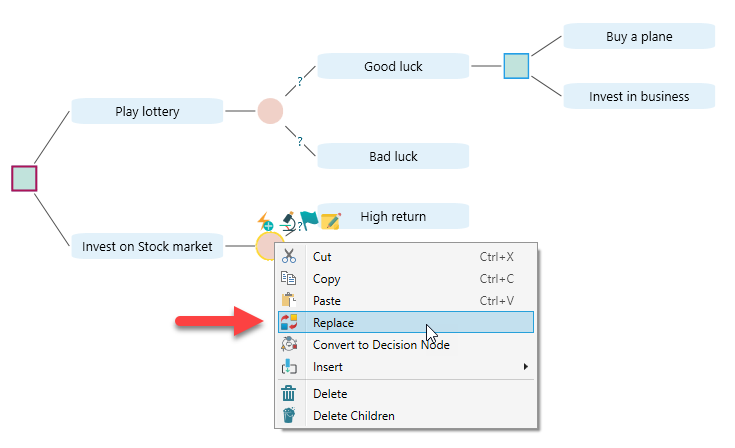 For example, select that converted Decision Node and right click to open the context menu, you will see the option "Convert to Chance Node". You can select a node and from the context menu (or using keyboard CTRL+C) you can Copy a node. For example, notice the following tree. We will select the Chance node and Copy from the context menu. 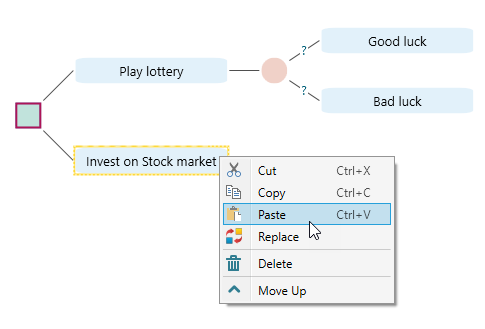 Now, select the option node "Invest in the stock market" and paste. Once pasted, the tree looks like this. 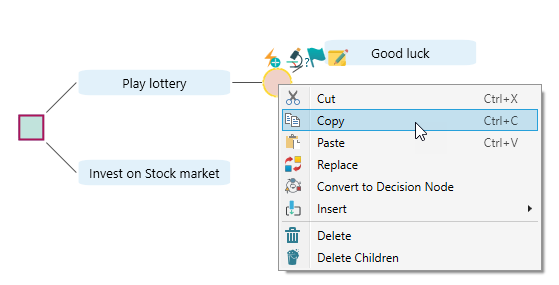 Same like, Copy and Paste, you can cut a node or subtree and paste over another node. Replace a Node with copied node or subtree. You can copy a node and replace a node with the copied node (along with its subtree). Consider the following tree. Say, you want to replace the node B with the node A. Simply copy the node A and select node B, then from the context menu, choose 'Replace'. You can even replace the root node using a copied node. For example, say you copied one of the decision nodes that have children "Buy a plane" and "Invest in business". Now select the root node and replace. Now, select the root node and open the context menu by right mouse click. Select "Replace". From the context menu of any node, you can find the delete option. You can use the Delete Key of your keyboard to delete a selected node too. When you select a node and if that node has children, you can simply delete its children from a context menu option "Delete Children". It won't be a fun if you could not insert a node between 2 nodes. 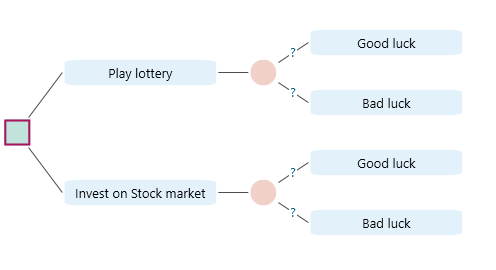 Once you formed a decision tree and realized that, there was another decision needed to be taken before some action, or you just realized a new uncertainty between 2 sequential decisions, you need to insert a new decision node, or a chance node or a simultaneous node. Right? You can use the Insert feature from the context menu to solve this problem. Say, you have a tree like this. Now, you realized that, when the car breaks down, there can be 2 uncertain scenarios, "Cell phone has network" and "No cell phone network". You can call a mechanic or dealership, only if your cell phone has the network signal, right? So, in order to insert a chance node after "Car breaks down", select the "Car breaks down" node and opens the context menu by mouse right click.